Make an advanced reservation for beach chairs and umbrellas so that you can lounge in style! 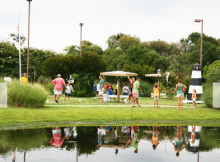 The Corolla Beer Garden has been serving up delicious craft beers since 2011 and is a favorite hangout for locals and visitors. They've got a spacious outdoor patio under a large oak tree that's perfect for spending a lazy day. 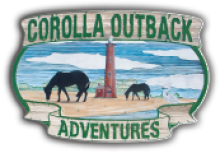 The North Carolina Outer Banks lies along a 105-mile strip of sand, sea, surf, and sunshine that runs from Corolla (in Currituck County) at the north end to Ocracoke (in Hyde County) at the south end - a bike rider's dream! 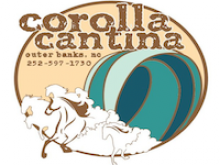 The Corolla Cantina serves up "beachy" fare for breakfast, lunch, and dinner, 7 days a week. This fun spot is family friendly AND they have a pet friendly patio! Family owned and operated since 1989. Serving up hand-tossed pizza, hot and cold subs, and Philly cheesesteaks. 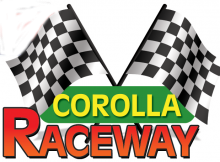 Take a spin on Corolla Raceways's Go-Kart track!